1834 – 1838 – ­High Falls Mill by Ben, John and Wm. Trollinger, Hopedale. Jesse Gant was an investor but not an active partner. The mill changed ownership several times over the years. In 1941 the present owners, Copland Industries, purchased it. 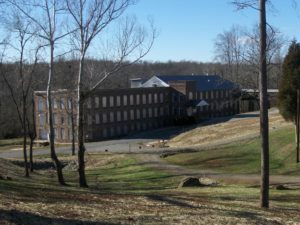 This mill has been in almost constant operation since 1838 making it the oldest operating textile operation in the same location in North Carolina. 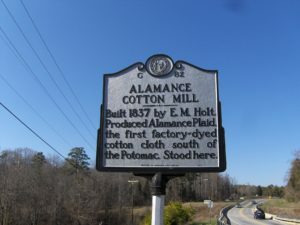 1837 – ­Alamance Cotton Factory by E.M. Holt and William Carrington on Big Alamance Creek several miles upstream from the Haw River. Holt purchased Carrington’s shares in 1851. Alamance Plaids, famous throughout the United States in the 1850s, were first produced here. They represented the first factory­dyed cotton cloth south of the Potomac River. 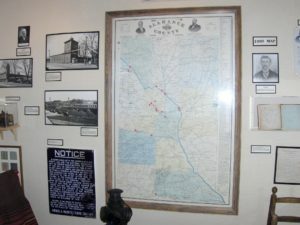 In 1926, John Schoffner and other investors purchased the mill and village of Alamance. The mill was used for hosiery finishing until 1947. The name of the business was changed to Standard Hosiery and relocated. A bronze plaque stands at the site today. 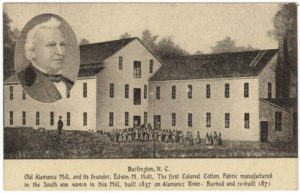 1848 – ­Saxapahaw Cotton Factory by John Newlin and sons, Saxapahaw. E. M. Holt purchased the operation for his sons­in­law. Later, the mill was purchased by Charles V. Sellers and B. Everett Jordan, and changed to the production of full­fashion hosiery. Today, the mill has had a total renovation as apartments by John Jordan and sons. 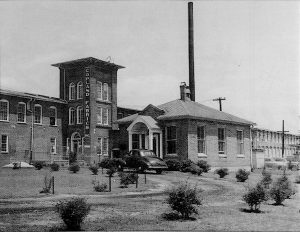 1868­ – Falls Neuse Manufacturing Company, Swepsonville by George Swepson and Gustave Rosenthal. In 1895, the name was changed to Virginia Mill. 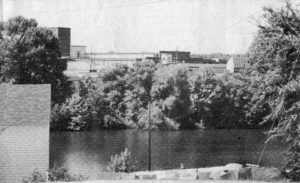 After 102 years of operation, the mill closed in 1970. The building burned in 1989 and has been leveled to the ground. 1869­ – Carolina Mill by J.H. and W.E. Holt, Carolina. Carolina is just up the Haw River from the High Falls Mill. With 3,000 spindles and 60 looms, E. M. Holt and Sons doubled production. The building is currently owned by Copland Industries. 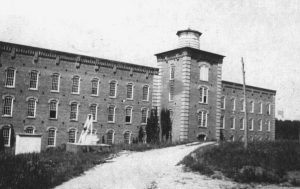 1878­ – Altamahaw Cotton Mill by John Q. Gant and Berry Davidson, Altamahaw. In the early years it was a yarn mill. By 1887, the mill produced cotton cloth. Later the main operations moved closer to Burlington adjacent to the North Carolina Railroad. 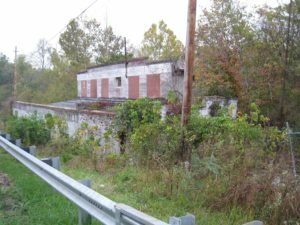 The Gant family business continues as Glen Raven Inc.
A view of the overgrown Bellemont mill along NC 49 south of Graham on Big Alamance Creek. 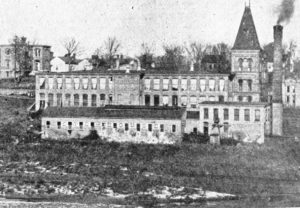 1879­ – Bellemont Cotton Mill by Lawrence Banks Holt, son of E.M. Holt. 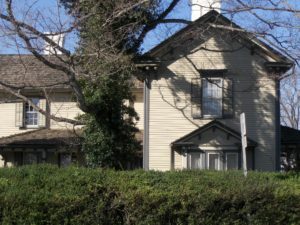 The original three story building on Big Alamance Creek was built by Berry Davidson. E. M. sold his share in the mill to Banks in 1883. 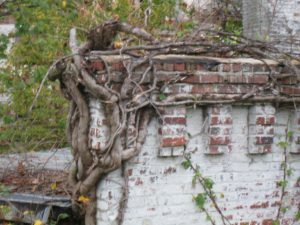 Today, the building walls are intact but covered with vegetation. Steam engines were originally developed in England and used successfully to pump water from iron mines and later to power textile mills. After the 1876 Centennial Exhibition in Philadelphia featured a gigantic Corliss Steam engine, mill owners gradually gained confidence that these could be used in North Carolina. 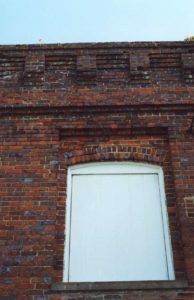 In 1882, Peter and Lafayette Holt and investor George Anthony built the Lafayette Mill, along East Webb Ave, Burlington alongside the North Carolina Railroad. It was the first mill in the county to operate by Corliss steam power. Water­powered mills were now passé. Lafayette also produced the first knitted fabric in Alamance County. The name changed to Aurora, Standard Hosiery , and later Kayser­Roth Hosiery. The building was torn down (2007). 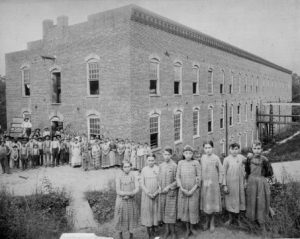 Alamance County’s cotton mill men were renowned throughout North Carolina and were generous in helping others set up cotton mills, including the Dukes who built five cotton mills centered in Durham, and in establishing the Pilot Mill in Raleigh. The Raleigh News & Observer was generous in quotes. In an 1892 celebratory issue devoted to the industry, the editor said, “We wish every county in the State was an Alamance.” In an 1895 article, similarly, “ The good old county of Alamance don’t (sic) seem to be selfish in the establishment of cotton mills. Perhaps she knows that she is safely in the lead and don’t (sic) mind helping other counties along, especially if the situation and environment appear inviting. Some of the largest plants in the State have been built by Alamance people in counties other than Alamance. The Pilot Mill of Raleigh is one of these. It was erected in 1892 by Capt. James N. Williamson and Mr. Wm. H. Williamson, of Graham, and Mr. O. H. Foster, of Raleigh.” By the turn of the 20th century, there were 30 textile mills in Alamance county. Burlington Industries was begun in Burlington in 1923 under the leadership of Spencer Love, who took a chance on the new fiber rayon. Burlington expanded by acquisition and new growth and became the world’s largest textile company by 1962. As economic conditions changed, Burlington gradually went into decline and was bankrupt by 2002. Divisions survive under International Textile Group ownership. 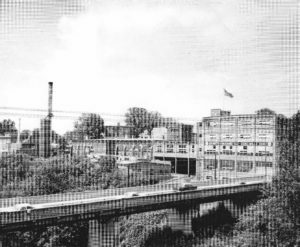 From the turn of the century onward, the city of Burlington added hosiery mills to supplement the textile business and, half a century later, attained the status of Hosiery Center of the South. The first mill was established in 1896. 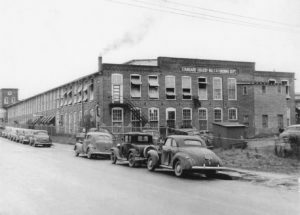 In 1950, there were 54 hosiery manufacturers in Alamance County, and almost everyone worked in a textile or hosiery­related business from the 1920s to the 1950s. 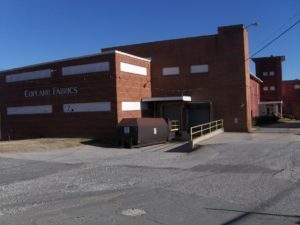 The present Alamance County textile companies are world­class international companies. Products include: tapestries, automotive and industrial fabrics, indoor­-outdoor fabrics, home décor and business interior textiles, as well as several name brand hosiery operations.